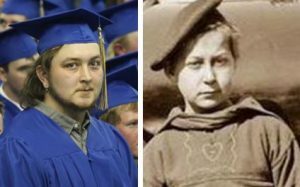 A while back, while looking at historical pictures, I came across one that bore an amazing resemblance to my grandson, Chris Petersen. I realize that a lot of people say that some people remind them of other people, but even my family agreed that this young man looked like Chris at that age. I have no idea who this boy is, or if he is related to Chris, because the picture doesn’t tell his name…just his occupation, which was quite interesting. The boy is, what is known as, a Powder Monkey. 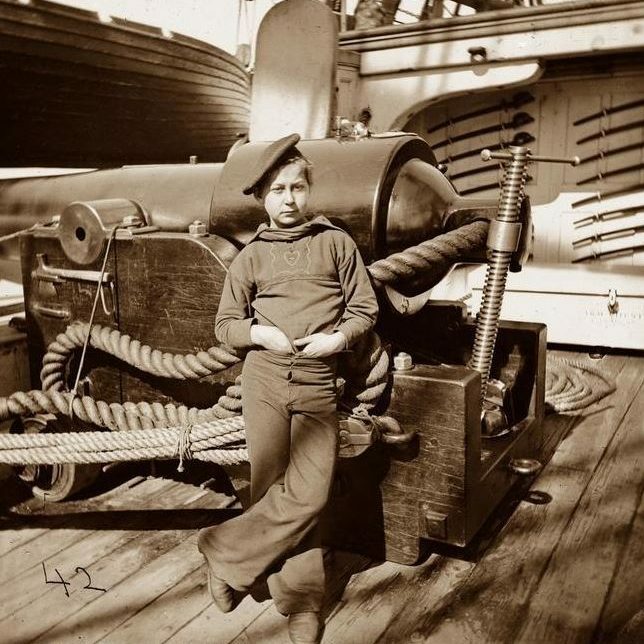 I had no idea what that was, and after doing some research on it, I’m thankful that powder monkey is not an occupation we have today, and thankful that my grandson never had the opportunity to be one. To me, it seems like a very dangerous occupation. Powder boys were used during the 17th century on warships. 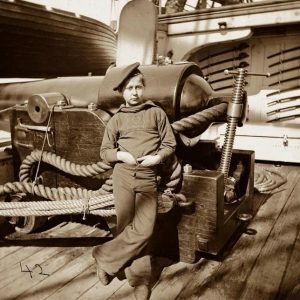 A powder boy or “powder monkey” manned naval artillery guns as a member of a warship’s crew, primarily during the age of sailboats. His chief role was to carry gunpowder from the powder magazine in the ship’s hold to the artillery guns. Sometimes he carried bulk powder and other times he carried cartridges, to minimize the risk of fires and explosions. The function was usually fulfilled by boy seamen of 12 to 14 years of age. Powder monkeys were selected for the job for their speed and height. They needed to be short so they could not be seen, and could move more easily in the limited space between decks, while remaining hidden behind the ship’s gunwale, thereby keeping them from being shot by enemy ships’ sharp shooters. Some women and older men also worked as powder monkeys. I realize that this might have seemed like a good idea, but as a mom and grandma, I would be terribly worried if that were my boy on one of those ships. While the Royal Navy first began using the term “powder monkey” in the 17th century, it was later used, and continues to be used in some countries, to signify a skilled technician or engineer who engages in blasting work, such as in the mining or demolition industries. In such industries, a “powder monkey” is also sometimes referred to as a “blaster.” It seems that just about any occupation that carries the name “powder monkey” is a dangerous one. As to the boys who did this work on warships, well…their bravery is amazing. They must have see death around them. They knew the risks. Still, they saw a need, and knew that their contribution would help their country. They were patriots, and as with any soldier, they have my respect. They should never be forgotten, because they were soldiers too…in every way.